The epitome of elegance, Waltz just makes you feel good. The first hour will give you what you need to move around the dance floor, then we'll teach a simple combination to enhance your cool. Dipping women has been a climactic moment in dance for centuries, and you really should know how to pull it off if you like romance and dancing. 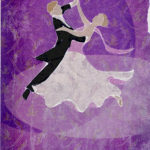 Our “Dips & Fancy Endings” workshop will help you turn an average dance into a spectacular one. All levels of dancers are welcome, partner helpful. $10/person. Try the fantastic West Coast Swing in our Monday night class: 6:30-8:00 p.m. at the Dance Scene (1011 H Street, Eureka). Our Last Wednesday Workshop replaces our regular classes with a featured topic that can be a specific dance style or even more specific like "Dips & Fancy Endings". All levels of dancers are welcome, no partner required. $10/person. Try creating a group private for you and your friends where we focus on what you want to learn. Monday night at the Eureka Moose Lodge and Tuesday evenings at the Humboldt Hill Grange. These are usually age 50+ events with a small entrance fee. "Monday Night Swing" at Redwood Raks World Dance Studio starts with a lesson followed by open dancing for all ages and levels. Eureka Elks Lodge has live music every Friday night and a nice dance floor (all ages welcome, but you have to know or be a member). 4th Friday night of each month at the Arcata Veteran's Hall. Wednesday & the first two Saturday nights at the Griffin Restaurant (Arcata) 9:00-11:00 p.m.
Every other Wednesday night at the Eureka Inn's Palm Lounge - check the North Coast Journal for the cycle. Thursday nights in the Kinetik Room at the Blue Lake Casino 9:00 p.m. - 1:00 a.m.. Check out Redwood Raks World Dance Studio schedule for special dance events.